This section of Marine Services addresses upholstery that is exposed to the elements and is, what can be called, "soft" upholstery, items such as exterior fixed seating, side wall pads, foam covered seating or lean back pads. 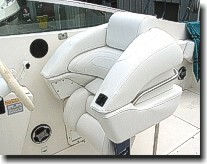 Catalina Custom knows the requirements needed in materials and construction of exterior marine upholstery to give the consumer years of service. 1) Polyurethanes - a new type of material that is very durable and provides the ulltimate in sitting comfort with a very soft feel or what is called a "soft hand". One very interesting aspect of polyurethane based fabrics is the heat retaining aspect of the material. Manufacturers test have concluded that poyurethane based materials is 20% cooler than vinyls and 13% cooler than leather when exposed to sunlight. 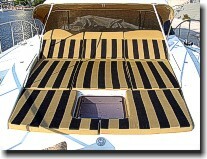 That provides more color options when designing upholstery projects for exterior useage with sunlight exposure. 2) Marine vinyls - have a very "soft hand" with hundreds of different colors and many different grains, finishes and patterns to choose from. New marine vinyls with UV and mildew resistant qualities, good durablilty, solid water proof surfaces with a new modern backing called Mellohide, provide the comfortable "soft hand" which makes a good choice for any outside upholstery project. 3) Canvas - (made with spefications for sitting upholstery comfort) can provide a nice soft, comfortable cloth to sit on with special qualities built into the material to provide long life when exposed to the elements in outdoor exposures. Catalina Custom provides hundreds of patterns and color choices from well known manufacturers such as Sunbrella and Outdura. Also, when using fabrics that are not waterproof, special considerations are taken into account for water extraction such as special foam, water extraction holes in hard frames and knit vinyl on bottom or back of foam covered pads. 4) Vinyl coated mesh fabric provides a unique quality of vinyl durability with a comfortable breathable aspect. Manufacturers such as Phifertex and Textilene offer top quality mesh fabrics for sitting comfort and slingable applications with many nice colors and patterns to choose from. 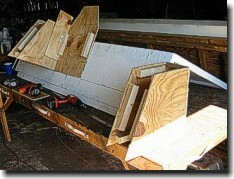 Another aspect of exterior upholstery to consider is frame and base construction when necessary. 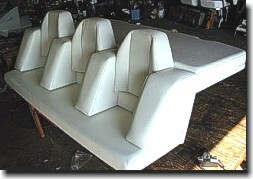 Catalina Custom has extensive experience in the areas of frame construction for exterior upholstery projects. Stainless steel hardware, all wood treated with polyurathane, joints glued and fastened, stainless steel staples, thread with specifics for outside exposure and foam with mildew resistant qualities when needed - these are all aspects of marine exterior upholstery that is not seen; but these are just as if not more important than the finished upholstery that provides long life for the project. 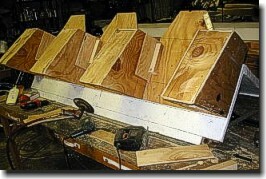 Photos below show progress of an extensive engine lid project. Catalina Custom took a basic lid and idea from the customer, designed, constructed and covered the seating area for this boat.